Welcome! We are a church center that provides many services to our neighbors in need. From hot showers to a free medical clinic and community meals, our services hopefully show the light and love of Christ in our broken world. If you would like to know more about our services, or how you can help, please contact Jeff Green, 619-481-5463 for a tour. Monday, Wednesday, Friday 9:15 a.m. – 10:45 a.m.
Wednesdays, 4:30 p.m. – 7:30 p.m. and Saturdays, 7:30 a.m. – 11 a.m.
All are welcome to join us for an informal worship service and communion in the courtyard at 5:30 p.m. A free medical clinic is also available for anyone in need. 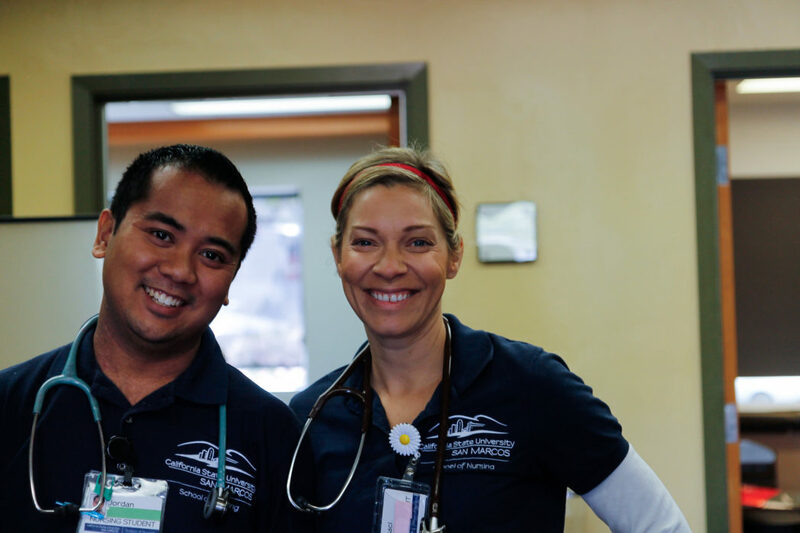 It is operated by the Cal State San Marcos nursing student team. A licensed medical doctor is also onsite. Thursdays, 4 p.m. – 7 p.m. Doors of Change is a San Diego non-profit organization that helps youth age 12-24 find shelter and learn life skills that help them become self-sufficient. The expressive arts program facilitates healing and empowerment through the creation of all mediums of art with an emphasis on recycled, sustainable art and jewelry. It meets on Thursdays at 4 p.m. at the Episcopal Church Center, 2083 Sunset Cliffs Blvd., San Diego, CA 92107. For more information, send them and email or visit their website: Doors of Change. Fridays, 6:15 p.m. – 9 p.m.
Sundays, 4 p.m. – 7 p.m. Doors of Change is a San Diego non-profit organization that helps youth age 12-24 find shelter and learn life skills that help them become self-sufficient. The music program provides free music, instruments and lessons to homeless youth. It meets on Sundays at 4 p.m. at the Episcopal Church Center, 2083 Sunset Cliffs Blvd., San Diego, CA 92107. For more information, send them an email or visit their website: Doors of Change. Clean up and out by 8 p.m.
No single contact for the program. Each Wednesday night has a different contact listed above. Each Saturday – approximately 8:30 a.m.
Other services offered: medical and mental health clinics, haircuts, Cal Fresh sign up.